When the time comes to cook outside, the choice of grill is extremely important. Outdoor cooks can be very particular about the size and performance of their grill. Char Broil has an entire line of grills to meet consumers’ needs, including the K6B 6-Burner 65,000 BTU Propane Gas Grill with Side Burner. One of the burners is a dedicated searing burner; another is the 10,000-BTU side burner. With 900 square inches of cooking area, electronic ignition, cast-iron grates, a stainless steel lid, control panel, and casters, the K68B includes many features shoppers desire. Measuring 65.5 inches long by 23 inches wide by 47.5 inches high, it is a large grill designed for those who do a lot of outdoor cooking. The Char Broil K6B is user-friendly in many ways. It takes less than two hours to assemble, with clear directions and easy to read diagrams. Almost all of it can be put together by one person, except toward the end when the grill itself has to be lifted and attached to the frame. The sturdy parts are well-made and solid. Once assembled, its size is impressive. Its huge cooking area is two to three times bigger than most grills in its price range. That makes it perfect for large parties, big gatherings, or very hungry families. But it isn’t necessary to always use all the burners. For smaller quantities, it is possible to just use a burner or two. To cook all the food its large size allows, the K68B has a strong heating system. The cast-iron grates are designed to conduct heat evenly. The grill reaches 400 degrees within five minutes. By the time twenty minutes goes by, the grill temperature will climb to 700 degrees. The back area gets hotter first, but then juices from the food drip. This creates flares on the heat tents, and the temperature rises quickly. The gigantic grill is also easy to use. The top opening allows the cook to check on the food without lifting the cover, keeping the heat in the grill. Cleanup is easy. The bottom of the grill slides out to take care of splatters and grease, and this surface is as simple to clean as the average pan. The grates require an ordinary grill brush for their quick cleaning.The base of the grill includes a large storage space underneath for the tank and accessories. But there are some drawbacks to the K6B, mostly involving longevity. The electric ignition switch may break easily, and this generally lights five of the six burners. This means manual lighting if the switch does not get fixed. The grill is also prone to rust quickly both inside and out, and after about a year many internal parts may need to be replaced. These include the burners, heat tents, and grease tray. The grease tray itself is somewhat flimsy. Casters may break when moving the grill. The burners only have two settings, high and low, which make it difficult to adjust temperatures. The brass burners also tend to clog frequently, which creates uneven heating. This creates hot and cold spots across the cooking surface. The thermometer is not water tight, so rain or condensation from the inside of the grill can cause it to fill with water. This affects its accuracy, and may cause it to stay at one temperature instead of reflecting the actual level of heat. The grease drain trap is not sloped, so the buildup of the grease may cause a grease fire. Though there is a cabinet in the base, there is no drawer for cooking utensils. 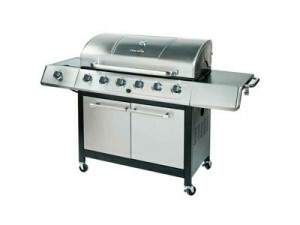 The Char Broil K6B 6-Burner 65,000 BTU Propane Gas Grill with Side Burner is a large grill for active cooks. Like any grill, it has its strengths and weaknesses, and the consumer will need to make the final decision about its value.